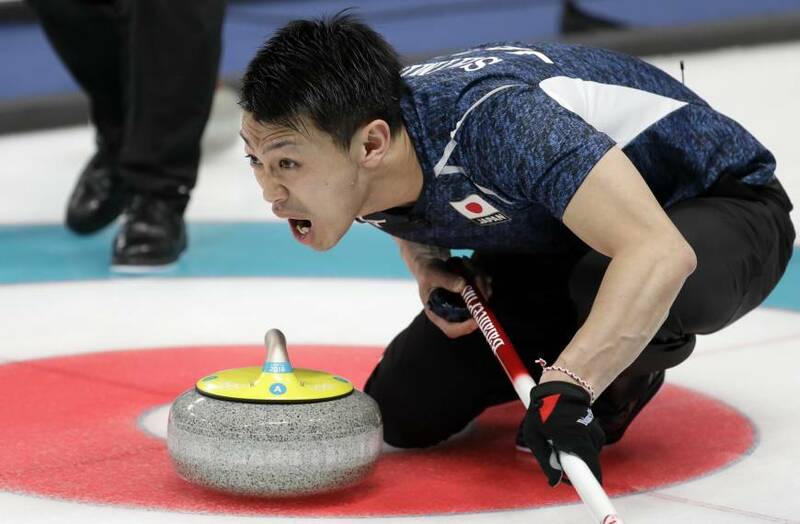 GANGNEUNG, SOUTH KOREA - Japan fell to its second defeat in a row, a 6-5 loss to Switzerland, in men’s curling at the Pyeongchang Winter Olympics on Friday. Switzerland took advantage of some strong tactical play early on and it was enough to see the reigning world bronze medalist take a slim victory at Gangneung Curling Centre. Japan got off to a sluggish start in the first end. Swiss vice skip Benoit Schwarz took out Japan skip Yusuke Morozumi’s draw stone on the final shot of the end, leaving the Swiss team with the three closest stones to the target for a 3-0 lead. But Japan pulled the score back to 3-2 on Morozumi’s take-out shot at the end of the second when it looked as if the Swiss might add another point with Schwarz’s draw stone kissing the edge of the button. The teams exchanged a point each in the next two ends before Switzerland made it 5-3 with another perfectly placed draw stone from Schwarz at the end of the sixth. The tide looked as if it turned for Japan in the eighth. With the Swiss team’s draw stone slightly closer to the center, Morozumi deployed a so-called promotion take-out, bumping his own stone at the front of the house forward to remove the Swiss shot-stone for two points and a 5-all tie. With one shot each remaining in the 10th and final end, and Japan with a provisional one-shot advantage, Schwarz gave his team the victory with the final draw shot. The Japanese men, who secured their first Olympic berth in 20 years and got off to a winning start in Pyeongchang with a victory over Norway before losing to Great Britain in their next match, next face Italy on Saturday. In other men’s matches, Canada, which is aiming for its fourth consecutive Olympic title, downed South Korea 7-6 and world silver medalist Sweden beat the United States 10-4 and Great Britain 8-6 for its third and fourth wins in a row.